On my first trip to León, Nicaragua, I felt like I’d gone 50 years back in time since leaving Granada, just three hours down the highway. By 2004, Granada was already well discovered by expats, had a lively and mature real estate market, and was as pleasing a Spanish Colonial environment as you could find…much like it is today. León, on the other hand, was a bit rough around the edges. It had all the basics of a great colonial destination—things like beautiful churches, attractive plazas, and a bustling town square overlooked by a massive cathedral. What’s more, there were literally hundreds of large, Spanish-Colonial homes, few of which were restored. But what it didn’t have was a real estate market. Nothing was for sale, as far as I could tell, and there was no real estate agency to be found. After a day of walking the streets on that first visit, I finally found an attorney who would serve as my real estate contact. As I left his office, he was calling his friends and relatives to see if anyone wanted to sell a colonial. But that’s no longer true today. In fact, each time I’ve come back during the past 10 years, León has continued to amaze me. Today, it’s become a destination that’s truly worthy of a property-buyer’s time and effort. The city is now more colorful, cheerful, and attractive than it was. The tumbled-down and abandoned buildings in the city’s center are gone, and in their place are twice the number of cafes, coffee shops, restaurants, and bookstores. We even found a Middle-Eastern restaurant and an Italian bakery. León has been on the move, but it’s still a young market. León is Nicaragua’s second-largest city after Managua, with around 143,000 people in the city proper. It lies less than two hours from the international airport in Managua, and only 12 miles from the Pacific beach at Poneloya. León was named the capital of Nicaragua in 1839, and although the capital was later moved to Managua, León remains Nicaragua’s intellectual capital today. 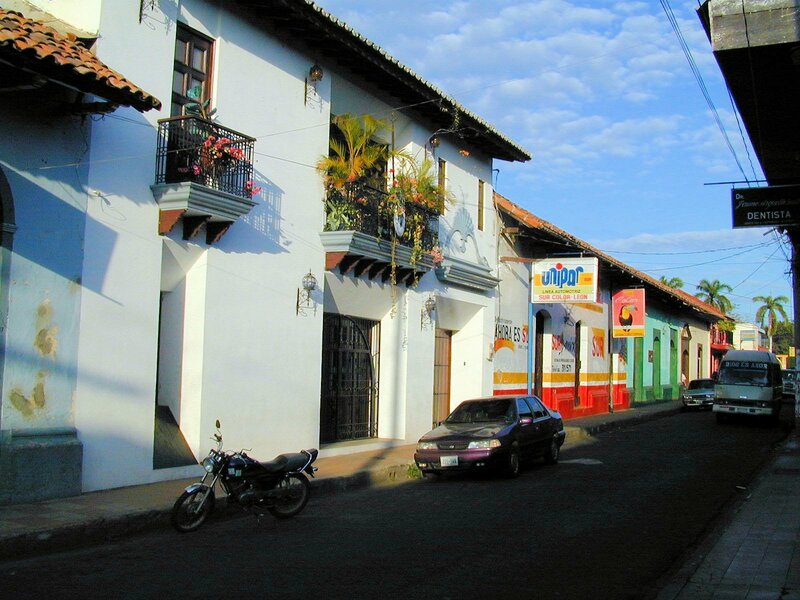 With its 17 colonial churches, museums, and narrow streets, León is a great way to get a glimpse into Nicaragua’s past. León is not all about Nicaragua’s past; it’s also about the future. It’s a university town, and you can’t miss feeling the energy and enthusiasm that comes with being surrounded by thousands of intelligent young people. The student population also helps to explain the narrow streets lined with small bookshops, cafes, coffee houses, and meeting places. León is also coming into its own as a potential expat destination, although there are still relatively few expats living here. You’ll find a large movie theater (which was playing English-language films), a supermarket, and modern medical facilities. León has come into the quasi-mainstream as a tourist destination as well. Formerly passed over, it’s now a mandatory stop for those exploring Nicaragua and Spanish America. The real estate market has changed, thanks mostly to expat Jordan Clark. He came on the scene almost 10 years ago, and assembled an inventory of good properties for the first time. Now that local sellers can see market movement, more and more properties are entering the market. Jordan and his wife Brooke even restored their own colonial home, which is one of the nicest you’ll see in town. There’s a fair rental market in León today as well, thanks to the ongoing construction and expansion of the nearby geothermal plant. At this time, foreign workers are looking for high-end, longer-term accommodations, and a restored home should rent pretty easily. Colonial properties in León tend to be much larger than those in Granada. And unlike Granada, swimming pools in their courtyards are fairly unusual (although you’ll find a few). Most houses will need some work to come up to North American standards. If nothing else, the kitchens will need to be modernized. Thinking back, I only saw one home where I wouldn’t touch a thing…and we’ll get to that. The market in León starts at about US$40,000. For that you get a two-bedroom, one-bath home about six blocks from the center square. Here are a few other homes on the market today. The next home has two bedrooms, two baths, an office, storage space, and an inner courtyard. It’s only two blocks from the town square. It’s newly renovated, including a new roof. I like the style of this one…it’s a classic, corner colonial-style home, with lots of windows to the outside. The asking price is US$75,000. Another good value is a larger four-bedroom, three-bath, two-story home in the center of León. It’s actually a modern home in the colonial style. It has a great balcony, with a volcano view. They even have beautiful ceramic tile on the garage floor. The asking price is US$160,000. We also found a large, four-bedroom, three-bath house just two blocks from the cathedral and town square. The house is totally renewed, including a nice modern kitchen. They used beautiful mahogany for the trim, and Italian tiles. On a quiet downtown street, the home offers a nice view of the San Francisco church. They’re asking US$165,000 for this one. The last one was impeccable…it’s the home I mentioned earlier that doesn’t need a thing. It’s a 4,300-square-foot, five-bed, four-bath colonial, with a sparkling pool and amazing views from its rooftop terrace. It has terra cotta floors throughout, with a great open floor plan including a large kitchen, laundry room, pool house, and garage. There’s an additional storefront commercial space with its own bathroom and its own access. This is probably the finest restoration of a colonial home I’ve seen in Nicaragua. The asking price is US$350,000. If you’d enjoy the many benefits of Nicaragua—things like the ultra-low cost of living, easy residency visas, and importation of your household and car—then it’s time to take a look at what León has to offer. I am a real estate investor who unfortunately has lost money in real estate after the recession. Today, I would love to buy an apartment or condo in Paris, France. I have heard about an area called Montmartre. What is your advice? Is this area subject to high appreciation as compared to other areas in Paris? I appreciate your response. For this question I deferred to Lief Simon, a long-time successful investor in Paris for both income and capital gain. According to Lief, Montmartre is not the cheapest area in Paris, but the sector has room for appreciation. It’s considered an “up-and-coming” neighborhood today (although it’s never been a bad area), and has one of the most active rental markets in the city. In fact, Lief’s most recent investment in Paris was in the Montmartre neighborhood, earlier this year. The other areas Lief would consider for short-term rental income (aside from Montmartre, in the 18th arrondissement) would be around St. Michel in the 5th arrondissement, most anywhere in the 6th, and Marais (in the 3rd and 4th). I live on the west coast of Canada, and as soon as I can, I would love to move to the west coast of Ecuador. What I would like to know is if there is any problem sending pensions to an offshore account. Generally, where you can send a private pension check and whether or not you can direct-deposit that check will depend on the entity issuing the private pension. Some are more flexible than others. The Canadian Public Pension System, however, is far more flexible than most private companies. Your OAS or CPP check can be direct-deposited in about 50 countries. And if you want your check in a foreign currency, there are about 50 countries on Canada’s foreign currency list as well. Ecuador is on the latter list, but not the former.